дома » ARMENIAN - ENGLISH CONVERSATION GUIDE հայերեն անգլերեն զրուցարան » ՀԱՅԵՐԵՆ — ԱՆԳԼԵՐԵՆ ԶՐՈՒՑԱՐԱՆ: ԵՐԿՐՈՐԴ ՄԱՍ: 5.ԱՌԵՎՏՈԻՐ. TRADE. Ներբեռնել լավ որակով ( PDF) 5.ԱՌԵՎՏՈԻՐ. TRADE. թրէյդ:( էջ 87-96). agencies all over the world. Previous post: ՀԱՅԵՐԵՆ — ԱՆԳԼԵՐԵՆ ԶՐՈՒՑԱՐԱՆ: ԵՐԿՐՈՐԴ ՄԱՍ: 4. ՖԻՆԱՆՍՆԵՐ. FINANCE. 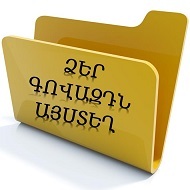 Next post: ՀԱՅԵՐԵՆ — ԱՆԳԼԵՐԵՆ ԶՐՈՒՑԱՐԱՆ: ԵՐԿՐՈՐԴ ՄԱՍ: 6. ԽԱՆՈՒԹՆԵՐ, ԳՆՈՒՄՆԵՐ. SHOPS.